This Christmas, don’t worry about spending a fortune on wrapping paper that will just be torn up and thrown away in a matter of minutes. 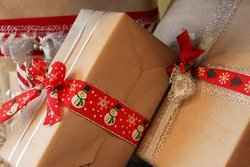 Make the folks on your holiday list feel extra special with these affordable, but personal and creative gift wrapping ideas. Old Maps: Go to your local thrift store, used bookstore, or search online for older paper maps. For an extra thoughtful touch, pick a city, town, or country that holds a special memory for you or the recipient. When you coordinate your ribbon or bow with one of the colors in the map, you’ll have quite an eye-catching gift! Sheet Music: Find old sheet music for cheap at your local thrift store or tear some out of your long abandoned music binder! Ask your friends and family for discarded sheet music as well. They may have a piano stool overflowing with sheet music that hasn’t been touched for years. 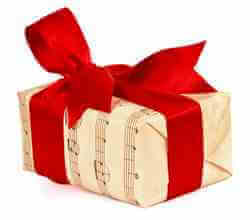 This wrapping paper is especially great for those that are musically inclined! 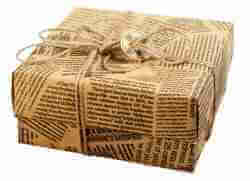 Brown Shipping Paper: This idea is especially handy if you need to mail your gifts. Buy a roll of shipping paper at your post office or start asking for paper bags at the grocery store (you can easily turn these inside out and use them as gift wrap). Cut large sections of paper off of the roll and let your kids paint or color on the paper to add a personal touch. Or, you can use a rubber stamp and ink to create a more consistent, traditional pattern. Paired with a simple red ribbon, brown paper can also look great on its own! Newspaper: If you no longer receive the local newspaper, your recycle center will still have an abundance of newspaper for you to choose from! Consider using the comics section for wrapping kids’ gifts, the sports section for wrapping sports related gifts, and the arts or home section for wrapping homegoods and small appliances! Fabric: Give new life to an old button-up shirt by following Jenn Playford’s instructions for turning a simple piece of fabric into an origami wonder. This gift is practically two gifts in one! Since the shirt doesn’t have to be cut or altered in the process, it’s totally wearable! Watch this video for the complete tutorial on shirt-wrapping. Large Potato Chip Bag: Leave it to Martha Stewart to turn something oily and trash-worthy into a holiday gem. Cut open a potato-chip bag along its seam to reveal the shiny white or silver inside of the bag. Wash the bag with soap and water and let it air dry. Cut the bag up into smaller pieces to wrap little gifts, or tape together a few bags to cover larger boxes. 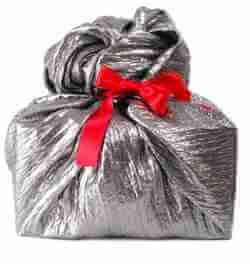 Wrap your shiny presents with festive ribbons and bows and you’re good to go! Waxed Paper: This is an easy and inexpensive way to dress up baked goods for the holidays, and much prettier than a plastic baggie or mess of tin foil. Your designs can be customized for any holiday too – even Valentine’s Day or Easter. Simply press small pieces of construction paper or ribbon between two sheets of waxed paper. Iron the two sheets to fuse them together and voila! You’ve made handcrafted wrapping paper for your home-baked goods! As you tie, tape, and top off your gifts with a personal touch, start thinking about next year’s gift wrapping needs too. 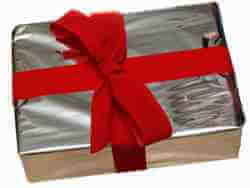 Start collecting and reusing the gift wrap you receive this year! On Christmas morning, sort nice bows, gift bags, and wrapping paper into separate piles to use again next year. Also, stop by your local drugstore and department store a few days after Christmas to stock up on steeply discounted wrapping paper. What a pleasant surprise! Add a little extra sparkle to your holiday memories by using the Festive Face App available for free in the Apple Store for iOS! Turn everyday photos into merry masterpieces with the touch of your finger, then have your creations printed and sent to friends and family around the world. What a great gift idea!